Sweethaaht Candle. Red Hot Cinnamon Scent. Great to show your lover you care on Valentine's Day Or Year Round! There's nobody quite like your Sweethaaht, and there's nothing quite like the hot & sweet scent of cinnamon. 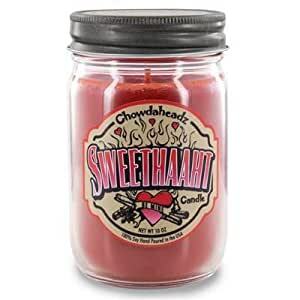 This candle smells just like your favorite Red Hot Valentine's Day candy! It's the perfect candle to warm you up and remind you and your Sweehaaht how hot and sweet love can be.